Click on this link if you need more information about a pneumatic gripper. 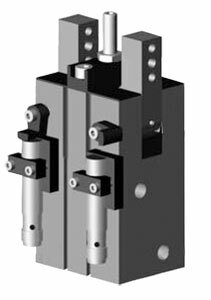 DCT Series Pneumatic Grippers are angular grippers with a 180° jaw opening allowing complete release of a directly fed part. Gripper forces ranges from 32 N (7.5 lbs) to 112 N (25 lbs). These pneumatic grippers are compact and designed for confined spaces, but consideration must be given to allow for the additional space required for the rotating jaws. The adjustable stop accessory (BR) will help to reduce the space requirement by restricting the open position. Standard mounting is from the top, but the gripper can also be mounted from the back of the body and will operate in any direction. Each jaw has a useful rotational stroke of 90° for a full 180° opening and there is a over-stroke of approximately 1.5° before reaching the fully gripped position. Jaws have to be designed to close for a grip of 0° gripping position (parallel jaws). Harsh Environments are no problem for this gripper due to the shielding that repels chips and other particulate from the internal drive mechanism. Note: To limit shocks at the end of the opening or closing stroke, it is highly recommended to design jaws with minimal inertia (as light and short as possible). Flow control valves make it possible to reduce the rotation speed and are highly recommended. Pneumatic linear motion automation components are double acting air cylinders that require a dry air supply with filtering to 40 microns or better. For best control of pneumatic components, flow control valves (regulating out) should be installed to regulate the speed of the device. Position sensors can easily be added to motion components to detect the end of travel positions of the slides, they are the standard method of communication with the PLC and are available in inductive or magneto resistive sensing styles and come in both PNP or NPN sourcing signals. To learn more about pneumatic grippers, view the Technical Reference Article "Introduction to Grippers"
Omega has "Additional Gripper Models " in stock for immediate delivery. * Addition of lubrication will greatly increase service life. Note: Sensor and cable sold separately. Inductive sensor not available on DCT-12M.